There are a lot of sweet photos on my hard drive from last weekend when our daughter and grandson came to visit. This one touches my heart. I had decided to get the paint out and make our hand prints on some finished pieces I had prepared. One went home with my daughter and the other is here with us. Sweet little Garrett hands along with Papa Mark, Grandma Friday, and Mommy. Grandma Friday (a.k.a. yours truly) decided that foot prints would be fun to try, too. Yellow paint, a piece of cloth, my kitchen floor, and a cookie sheet to hold the paint. I step in the paint, nearly fall on my *_____ because it is slick, and then onto the cloth. I repeat this process with Garrett, carefully placing him just where I want him to stand. And all went pretty well. Except we had very yellow feet. Off to the bathroom, sit on the edge of the tub, use lots of water and soap, add some giggling when we see how yellow the tub gets…and there went the paint down the drain. And here I have this beautiful canvas, and great memories! Sweet little feet of a bright and handsome and fun little boy who wore his superman cape the whole weekend. Compared to the size of mine I know they are small, but no bigger imprint has been made on our hearts, let me assure you. As I write this there are some toys still sitting in the living room, reminding us of the time we spent. It is always hard to put those things away. Always. 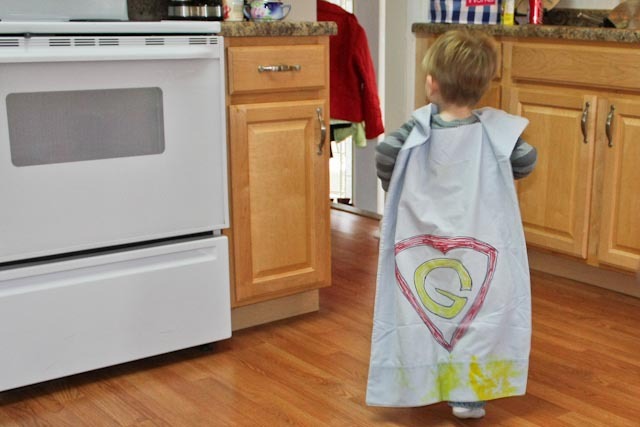 Superman flew through my kitchen a lot. now and then and needs special Mommy attention. Meanwhile, this has been the perfect week to step back from blogging a bit and think about what direction it will take. What has come to my awareness is just how much time I spend each and every day looking at a computer screen…and it is too much. After working five hours at a computer five days a week, then coming home and reading other blogs, doing my own work, it gets to be a lot. Can you relate? My challenge is to find a way to use my time more wisely. I’m so grateful for the time with family and friends, face to face, heart to heart, sharing our lives and our stories. I still want to share my story here with images and words. April is my time to fine tune that, and I thank you for your patience. Thanks, Anyes! Yes, they will be there forever. It was so much fun! How precious! The world of grandmotherhood is pretty darn wonderful, isn't it? We will be heading to Illinois for our grandson's birthday in mid-April – I can't wait! And yes, I can relate to your concerns – while I no longer have to spend time in front of a monitor for other people since my retirement, it is easy to fall into that trap of thinking pixels are the only way to "be" in this modern world. I applaud your decision to re-think. I love how you describe that 'trap'…thinking in pixels. It is so appropriate. What precious memories you've made!! Thank you, Tammy! I'm going to hold this image in my heart forever. These are the memories that will stay with you forever. How did you get the name Grandma Friday? I know what you mean by spending too much time in front of a computer screen. I have turned down my computer time considerably. I am slow in responding to blog posts and visiting other blogs, but when I do I do it with my heart – and that is important. Since I have started to do that, I enjoy it so much more – and have also more time in the studio. The name "Grandma Friday" came about last fall. My daughter told her son that "Grandma is coming to see us on Friday." (which was true as I was to spend the weekend there). He was almost two. Moments later he went back to mommy and said, "Grandma? Friday?" My daughter decided to make that name stick…and it has. I absolutely love it! I appreciated your remark about doing your blog commenting from your heart. There is much for us to learn from that. Love…love…love these yellow footprints. My favorite kind of cherished art!! And – you know I'm right there with you with this re-evaluating how it is we spend our days and time. Growing and evolving together..
Marcie, thank you, not just for the comment, but for sharing this journey. Love this idea, Deborah! Such fun times to remember together…the day of the yellow feet! I understand how it can be a struggle to fit everything into our time schedules. I know it's even more difficult when you work! I enjoy your posts whether they be long or just a few thoughts. You always accompany them with such beautiful photos. Hope you have a great week!